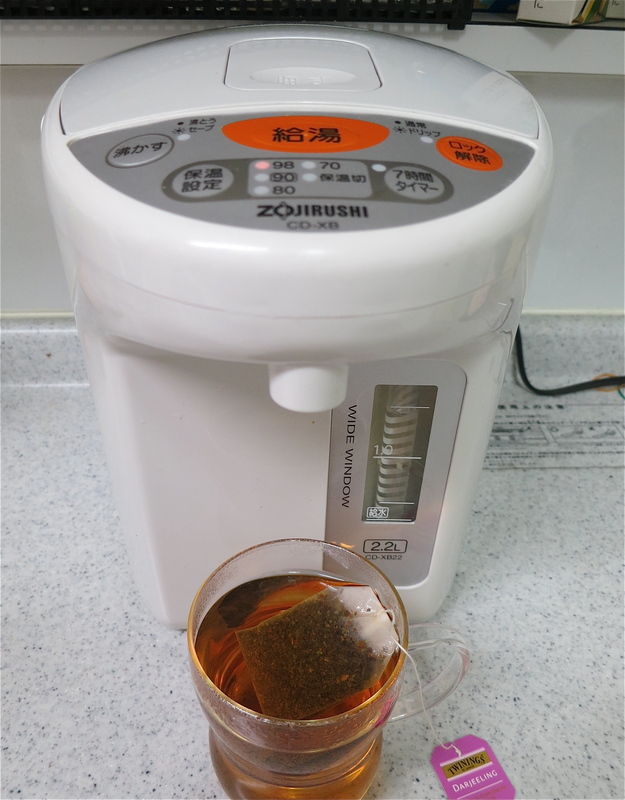 Although they fail to mention it in the operating instructions, this convenient Japanese appliance makes a perfect cuppa tea and also doubles as a Weapon of Mass Cockroach Destruction! This morning when I went out to inspect The Trap, I found My Nemesis looking righteously dead in a corner. I cautiously lifted a corner of the tape, only to leap back in horror when It’s Royal Revoltingness scuttled about madly, thus revealing that it was either a) miraculously still alive and not the least bit suffocated or b) a zombie cockroach. In case it had joined the ranks of the Undead, I quickly added six more layers of tape, replaced the dictionaries for good measure, and went off to Japanese school. Yeah, pour boiling water on it. It’ll die. No way. It can’t be that easy, or everybody would do it. Then I imagined the Typical Zombie Cockroach Attack, and realized that chasing one around the apartment with a pot of boiling water would be somewhat more difficult than pursuing it with a rubber rainboot. Fortunately, mine was conveniently cornered in a plastic bag! After stealthily snipping a hole in the top of the baggie (trying not to remember the one I saw FLYING earlier in the summer) I poured in the boiling water. Die, cockroach, die! Thank you, Our Lady Of Glow-In-The-Dark, it complied! Now the only thing I have to worry about is that piece of information I accidentally read in Wikipedia while trolling for suffocation info: cockroaches have been proven to always hang out in dark places with other roaches. Do you think if I just sealed off that closet with my leftover tape…?